Number of children and young people killed or seriously injured continues to fall but still too many preventable accidents. Public Health England (PHE) today launches 2 new resources for local authorities on preventing accidents to children and young people in the home and on the road. The reports show whilst the number of children and young people killed or seriously injured continues to fall in England there are still significant numbers of deaths and emergency admissions from preventable causes. On average each year between 2008 to 2012, 525 children and young people under 25 died and there were more than 53,700 admissions to hospital. The reports highlight actions local partners can take to reduce accidents including improving safety for children travelling to and from school and using existing services like health visitors and children’s centres. 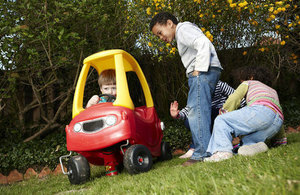 The Reducing unintentional injuries in and around the home among children under 5 Years and the Reducing unintentional injuries on the roads among children and young people under 25 reports include an analysis of data between 2008 to 2012. Whilst unintentional injuries are continuing to fall, there are still too many accidents taking place either in the home or on the roads, many of which are preventable. Local authorities and their partners, such as the NHS and emergency services, are already doing lots of good work in this area and these new resources can provide some extra support to help them to prevent more injuries and deaths. The reports are published during Child Safety Week (23 to 29 June 2014), an annual campaign by the Child Accident Prevention Trust (CAPT) to raise awareness of the risks of child accidents and how they can be prevented. The focus of the campaign is the simple actions parents and families can take every day to keep children safe. CAPT, and the Royal Society for the Prevention of Accidents (ROSPA) were commissioned by PHE to undertake this work. Children continue to be killed or disabled in accidents that can be prevented and the poorest children are at greatest risk. Local councils and their partners can achieve a step change for children, often at low cost, by prioritising the accidents that matter and mobilising existing services. That’s why PHE’s call to action is so welcome. We encourage PHE to support councils over the long-term, helping them to understand the benefits and savings that work on accident prevention achieves. Accidents are the biggest killer of children and young people, wiping out hundreds of young lives each year and causing untold suffering to families across the country. But so many of these accidents could be prevented for very little money. Helping children to grow up safely should be a priority for all of us, and that’s why we’re pleased to have been involved in this new guidance for local authorities, which is where important decisions about public health spending are made. Public health has many success stories, but the challenge now is to replicate that success in accident prevention. As well as the national reports PHE is releasing figures which provide local authorities and other local partners with information on the number of unintentional injuries in the home and on the roads to help inform the work they do in this area. Reports for each local authority are available with more local data on the Child and Maternal (ChiMat) Health Intelligence Network website. CAPT press office: pam.prentice@capt.org.uk and amy.charters@capt.org.uk. Telephone: 020 7608 7361 including out of hours.